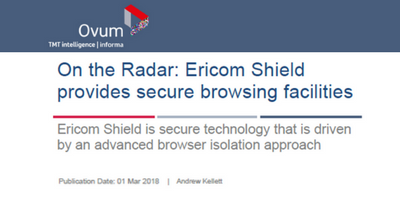 Ovum Places Ericom Shield "On The Radar"
Global analyst firm Ovum has chosen to highlight Ericom Shield Remote Browser Isolation (RBI) solution in its prestigious “On the Radar” series for its ability to provide airtight, yet frictionless protection from browser-borne threats (e.g., ransomware and other malware, malvertising, crypto-jacking), while enabling a seamless user experience for both users and security staff. The report emphasizes Ericom Shield’s centrally managed and client-less design, which requires “no on-browser or on-device software,” as a key advantage of the solution. The report also highlights the content disarm and reconstruction (CDR) tools included in Ericom Shield, and which sanitize downloaded files of potential malware before they are released to endpoints. Ovum recommends that organizations of all sizes put Ericom Shield on their radar as part of a layered, defense-in-depth strategy for securing user browsing sessions, addressing the potential for bad clicks and other types of human errors, and keeping operational systems safe from known and unknown web-borne threats. Read the full report to discover why!